A helpful list of eight attractive and developmentally appropriate newborn toys that are perfect for babies ages 0-3 months. I’m pretty picky about what I buy. 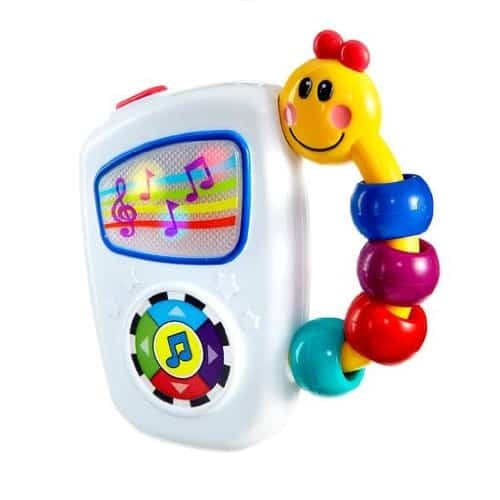 But when it comes to toys for the youngest babies, I’ll often defer to the professionals and give babies what they find most stimulating: newborn toys in bright colors with strange textures and funny sounds. That said, I’ll still try to find the better-looking ones! 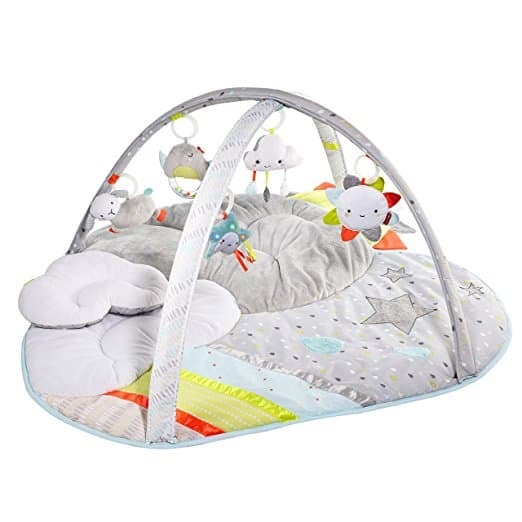 Even if it seems like your baby will never do anything but sleep and eat, you’ll want a few toys that will encourage your child’s development while adding some novelty to your day. An activity gym is my number one toy recommendation for new parents. My daughter began spending a few minutes a day at her “gym” within the first week of her life! An activity gym a perfect place to practice tummy time. Even if your baby doesn’t seem to enjoy it, it’s important to get some tummy time in every day. Tummy time helps strengthen your baby’s neck and shoulder muscles, which they’ll need to begin crawling and walking. Did you know that it provides a foundation for motor skills? Practicing tummy time on the floor at the activity gym for 3-5 minutes a few times a day is really pretty simple, and it’s a nice way to encourage your baby to interact with his surroundings. When your baby gets older, she can start reaching for the hanging sensory objects and begin practicing her swatting skills at her activity gym. You can read this detailed article on the developmental benefits of using a baby play gym written by Mama OT, a pediatric occupational therapist. A friend advised me to resist buying wooden rattles for my baby until she could sit up and had established good arm control. 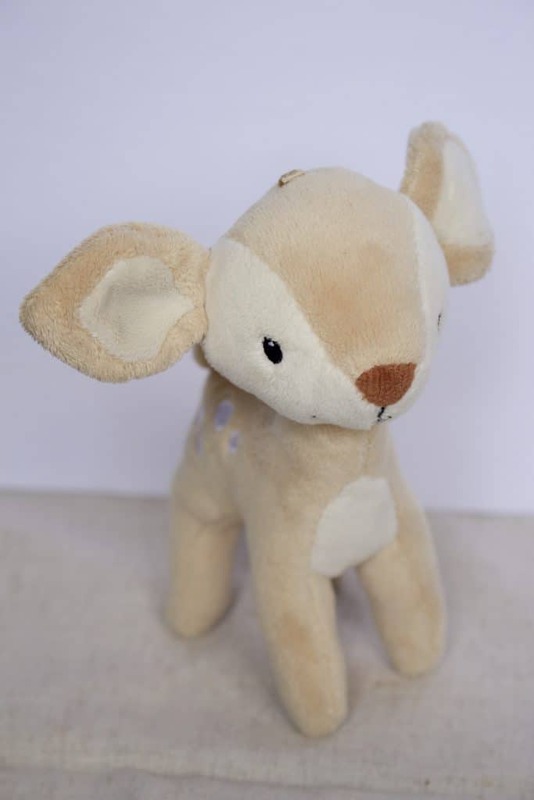 Soft rattles are simply a gentler option. (And I’m all about minimizing accidental bumps and bruises!) I chose a variety of soft rattles with different colors, textures, and sounds to provide several different sensory experiences for my baby. 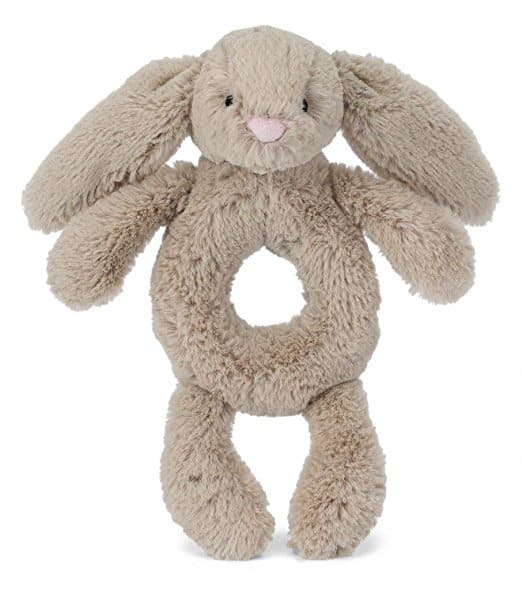 I’m particularly fond of these soft rattles by Jellycat. I also adore these knit rattles from Bla Bla Kids. Books are a great for children of any age, but sensory books are ideal for babies under six months old. My daughter played with this nursery novel on a daily basis. It provides several different stimulating textures, sights, and sounds (without any batteries or flashing lights)! Crinkle paper makes such a satisfying sound! 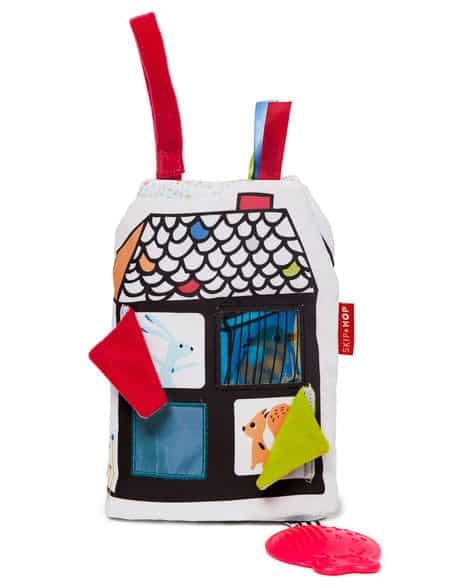 It’s a simple toy that’s easy to make, and it fits into a crowded diaper bag without a problem. I found this brand on Amazon that offers an array of patterns and colors. Playing with finger puppets is a fun way to talk with your baby! You can have the puppets interact with the baby, sing songs to the baby, interact with each other, etc. 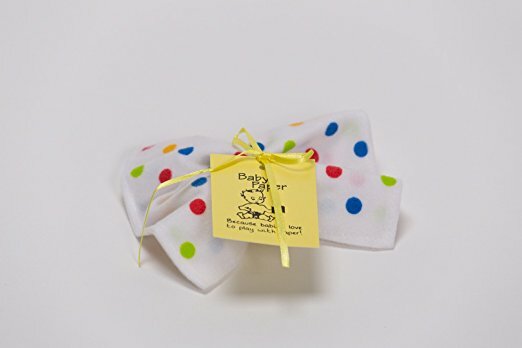 They’re soft, portable, and they can encourage your baby’s verbal development. I’ve found some affordable IKEA sets on Amazon. 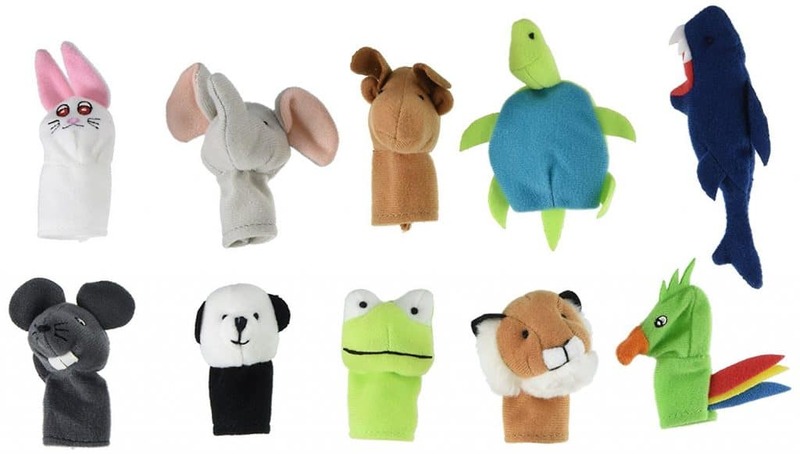 Finger puppets are also nice because they can transition with your child past the baby stage. Use a mirror when your baby is playing on the floor. A mirror makes tummy time a bit more interesting! 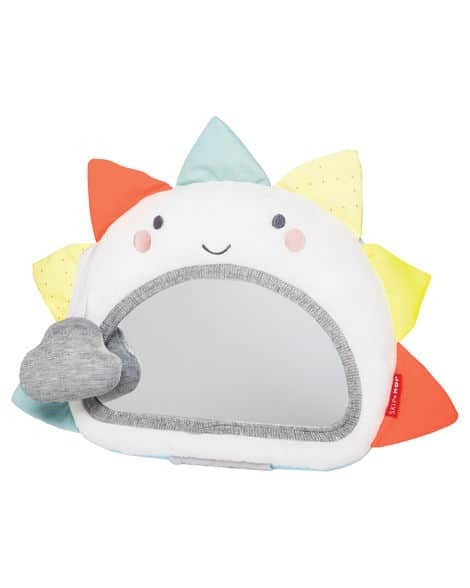 Babies love to look at themselves in the mirror, so you’ll see little mirrors on many newborn toys. Here’s a helpful article from What to Expect about why this is true. I’ve written about Take Along Tunes before, and I’ll recommend “the Tunes” again here. Sometimes you just decide to give into the flashing colored lights and that electronic version of Clair de Lune. These diversions should keep your little one quite busy—when they’re not sleeping and eating, of course! I recommend buying a small bin to keep these items all in one place. I think it will delight you to see how much these small and simple things will thrill your son or daughter as you play together. 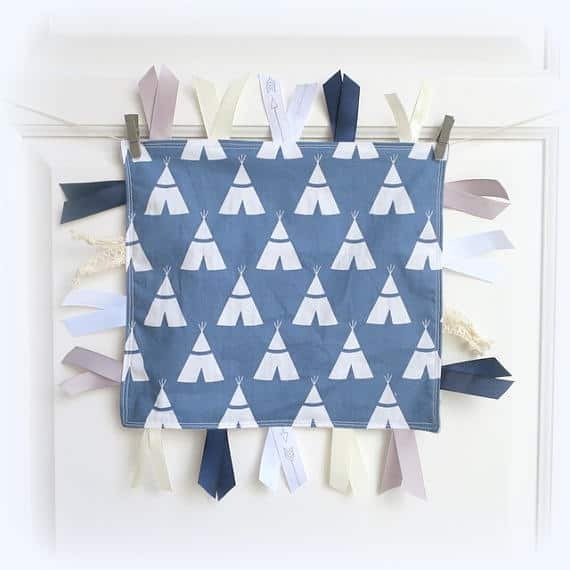 Still looking for more newborn toys and playroom inspiration? Check out my playroom board on Pinterest and my roundup of black and white toys for babies. Now I wish I had a baby to give these to! That activity gym and finger puppets are adorable! Thanks, Brenda! The finger puppets are so fun. I love pulling them out for long car rides even now. The sensory books definitely keep them busy! The activity gym was both of my kid’s favorite toy. They could be on their back or on their stomach and always find something to explore and play with. I love those sensory books. What a fun way to explore sound, sight and touch. And the mirror is such an adventure. All babies love to smile at themselves! Great collection of toys! Thanks Bonnie! It’s so fun watching babies discover the world of touch, taste, sight, and sound! I think my son had a version of all these toys. He loved the crinkle toys and the still loves his monkey blanket with the taggies around the edges. Great post! Thanks Stephanie! So cute to hear about your son’s monkey blanket! These are so cute! I’m definitely using some of these for my next child, fingers cross! Though I’m not a parent, these are some awesome picks! That gym sounds amazing for a baby. Great picks! I can’t stand the noisy electronic toys that people seem to insist on giving my children. These are perfect. It’s so funny how those noisy electronic toys are so ubiquitous! This is a great list, and I’m going to check out your round-up of black and white toys for babies! I 100% agree that an activity gym is a fantastic choice for a newborn/infant toy. Thanks for checking out the black and white toys roundup! That was a fun one to put together! This is exactly what I needed! My sister is due next month and I’ve been agonizing over what to get her when the baby arrives. So this is the perfect list for my dilemma! Our daughter is 11 weeks old. We gave away our activity gym before she was born and reading your post reminded me that that was always one of my children’s favorite things to play in. I’ll have to check the one you recommended out. Congrats on your little one, Kristi! Such great ideas! I agree with all of them- especially the activity gym! Thanks Amy! The activity gym really provides hours of entertainment.